S​pearitwurx creates opportunities for people to “Experience Transformation”. 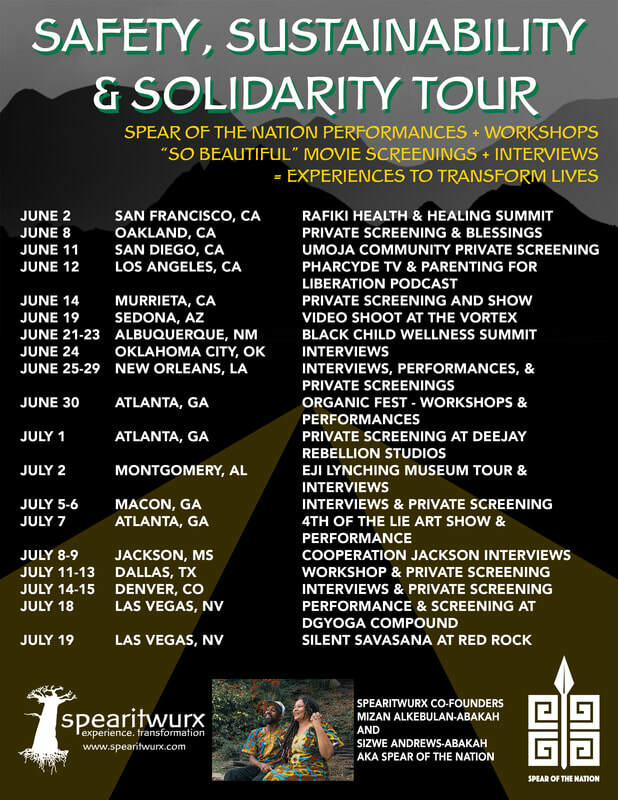 This summer, Spearitwurx will embark on our first Safety, Sustainability, & Solidarity Southern Tour to share authentic experiences in our journey of parenting, contribute tangible tools that can support healing families from social toxins, and document vibrant and healthy families to shift the narrative of wellness in communities of color. To share the latest music by Spearitwurx’s own, Spear of the Nation, aka Sizwe Andrews-Abakah, through live performances. This fifth solo studio project entitled The Prophecy echoes the themes pertinent to this Summer Tour. We will also show the new docudrama starring Sizwe called “So Beautiful” that documents the Sankofa journey from Oakland to South Africa to fulfill ancestral promise and find the meaning of his name (393Films). It is our intention that this tour is part of larger ongoing effort to strengthen communities, with a focus on the power of family. We hope to contribute to the collective effort to reduce domestic violence and the disproportionate incarceration of young people of color. We also want to promote healthy living strategies, increase inter-generational wellness, and improve our collective capacity to sustain healthy/joyous relationships as the backbone of the struggle for liberation. The time is now for expanding this work, with families in the forefront of the movement for social justice, safety, and sustainability.